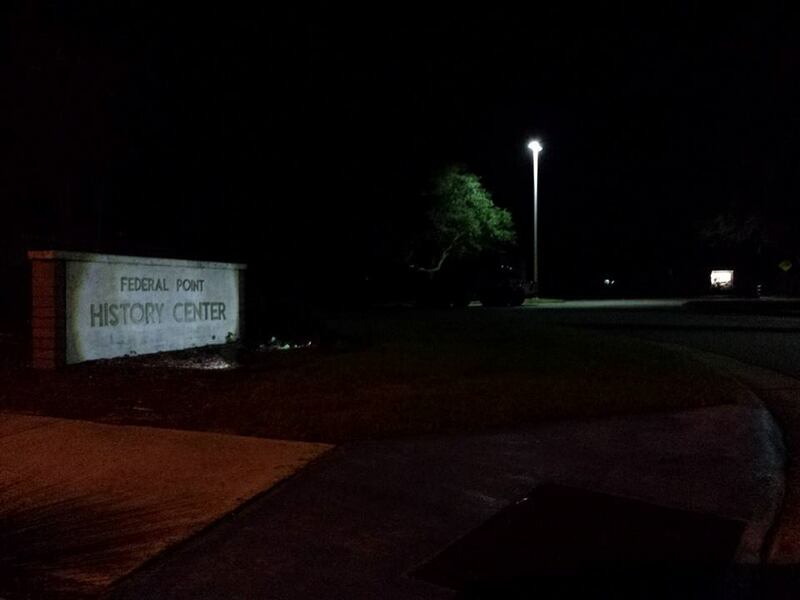 We’ve doubled the luminosity of the lights on the History Center sign tonight. The Federal Point Historic Preservation Society is posting this article in honor and memory of Larry Bame who died September 10, 2014. Larry was a 3rd generation Carolina Beach Bame and contributed to this article. Starting with a seasonal café and gas station, coupled with big dreams and hard work, J. R. Bame built a small empire making a year round living for himself and some of his eleven children. This story was originally dedicated to the memory of Ruby Bame Knox who died on August 11, 2009 at the age of 96. Ruby was the last survivor of the eleven children born to J.R. and Mandy Bame and was interviewed for this story in January, 2009. She made her home in Carolina Beach until the year 2000 when she moved to Salisbury to be near her daughter, Joyce. The images for this story were provided by the author, Doris and Larry Bame and Joyce Knox McLaughlin. At the beginning of the 20th century James Rowan Bame and Amanda “Mandy” Ludwig Bame began their life together as a young married couple. They lived in Salisbury, North Carolina in Rowan County and later moved to a small nearby town called Barber. There, J. R. opened a general store by the railroad tracks. Some time later he built a cotton gin in Barber and another gin in Bear Poplar which was close by. A few years later he added a café to the general store. J. R. and Mandy Bame had eleven children born from 1905 to 1929. 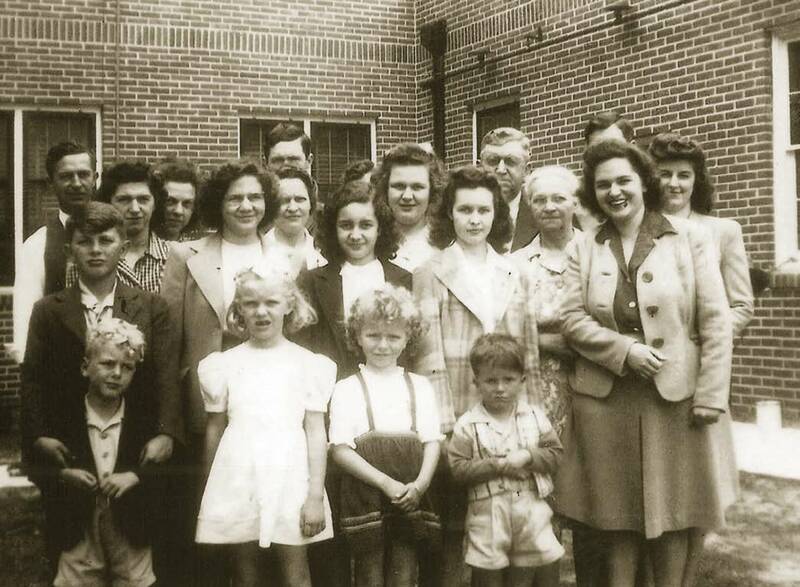 Summers would find the young Bame family at Carolina Beach visiting Mandy’s parents, J.O. and Laura Ludwig. The Ludwigs had moved to Carolina Beach after J. O. retired as a builder in Salisbury. They operated a rooming house on Cape Fear Boulevard just west of Lake Park Boulevard. By the mid 20s J. R. Bame decided to open a café and gasoline station at the beach and stay all summer with his family. Improved roads and automobiles or “machines” had replaced the river steamer and train way of coming to the beach. In the season, there were hundreds of autos bringing thousands of beach goers to Carolina Beach and J. R. decided to capitalize on the growing beach community. 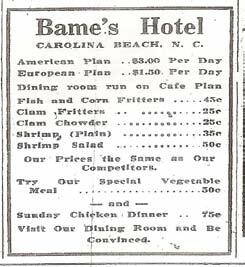 The dining room of J.R. Bame’s located on Cape Fear Boulevard, Carolina Beach, known as “Bame’s Café” was officially opened during the first of the week, owing to the incessant demands for some dining hall being operated early in the season. Mr. Bame had one of the best locations on the beach and in conjunction with his café operates a confectionery. His dining room is spacious, neat and screened and conveniently located near the dance casino [Note: The Pavilion]. A complete line of soft drinks, candies, “pop-cycles” and other confectioneries were available. The only gasoline filling station located on Carolina Beach is owned and operated by Mr. Bame, near the center of the resort. Ruby Bame Knox, daughter of J. R. and Mandy, remembered the “pop-cycles” well; she said they made by them by putting a scoop of ice cream on a stick and dipping it in chocolate. She also remembered heading to the beach when school was out each summer. Making the trip with such a large family was quite a fete. The youngest children and their parents piled into the large sedan with pull out seats. The older children came in pick up trucks which were loaded with luggage and supplies. 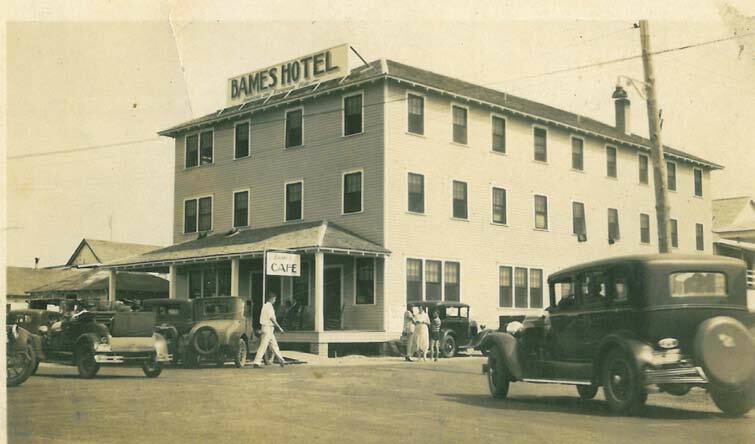 In spite of the Great Depression and stock market crash in 1929, J.R. Bame revealed plans to build a hotel at Carolina Beach in the spring of 1930. 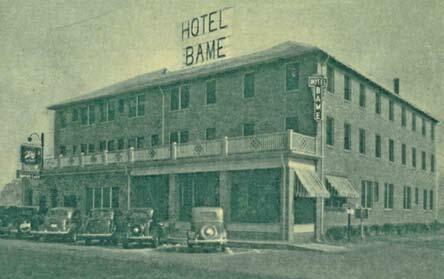 Bame’s Hotel was beside his café in the first block of Cape Fear Boulevard and opened in June. 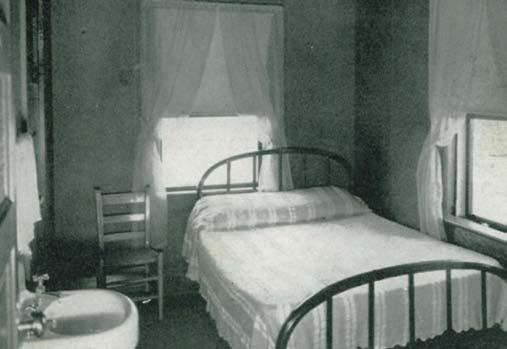 It boasted 33 comfortable rooms with running water, tubs and showers. It was a three- story hotel with a white wooden exterior and was modern in every detail. And with “Miss Mandy” supervising the cooking, the new dining room was overflowing with diners. 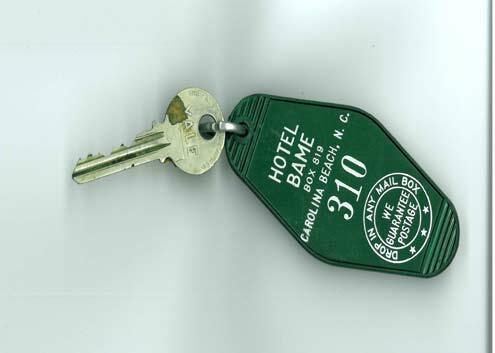 The first Bame Hotel opened in June of 1930 and was built by James Rowan Bame from Barber, North Carolina. It stood on the first block of Cape Fear Boulevard, had a white wooden exterior and had 33 rooms. According to Ruby Bame Knox, who was a rising high school senior that first summer the hotel opened, most people stayed at least a week or two. Ruby worked at the front desk and waited tables in the dining room. She also babysat for her older brothers and sister who had families of their own by now. She used to take her nieces and nephews under the pavilion (which was on pilings in the front) so they could be in the shade and play in the sand. Her older brother George Bame came every summer to help her parents run the hotel. 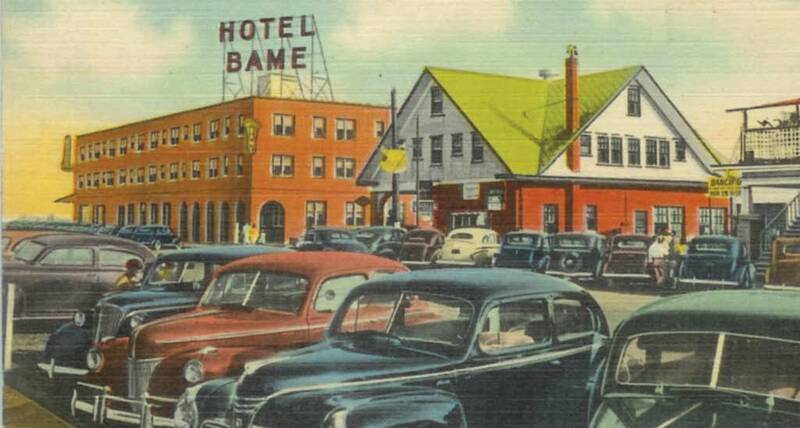 The 1935 remodeled and enlarged Hotel Bame is featured on this postcard. It had a brick exterior, 60 rooms, a dining room and a grill that faced the boardwalk. It was destroyed in the September 19, 1940 fire which also leveled two blocks of the boardwalk. 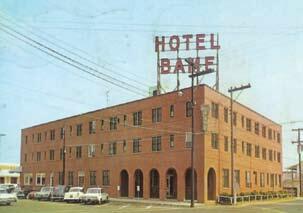 By the mid 30s J. R Bame had decided to remodel and enlarge the hotel. The end result was a bricked exterior with 60 rooms. There was a large paneled dining room in the hotel along with a grill that fronted on the boardwalk. The family stayed in rooms on the first floor during the summer but returned to Barber in the fall for the school year and the family businesses there. An inside glimpse of one of the 60 bedrooms of the remodeled 1935 Hotel Bame shows two large windows with the bed in between. One can just imagine the sounds of the rolling surf and cool breezes. Guests had a lavatory for convenience since the bathroom was down the hall. Eventually J. R. and Mandy moved permanently to Carolina Beach. Their first house was on Charlotte Street. For their 50th anniversary the Bames built a large comfortable brick house at 714 Cape Fear Boulevard. Later their son Ernest and his wife Rachel lived there too. This postcard shows the Hotel Bame rebuilt after the 1940 fire. It had 80 rooms, 65 with their own bath. This hotel and its predecessors were located on what is now the vacant lot between the Marriott and the Gazebo. Hurricanes are not the only disasters in Carolina Beach history. A devastating boardwalk fire on the night of September 19, 1940 ranks near the top. The fire began in the pavilion on the boardwalk and swept two blocks south destroying every building in its path including the Bame Hotel. The sprinkler system installed by J. R. Bame was rendered useless when power was cut to the boardwalk area, so the hotel burned to the ground. “Mr. Jim”, as J. R. was often called, and the other business owners vowed to rebuild and be open in time for the summer season of 1941 and they did. 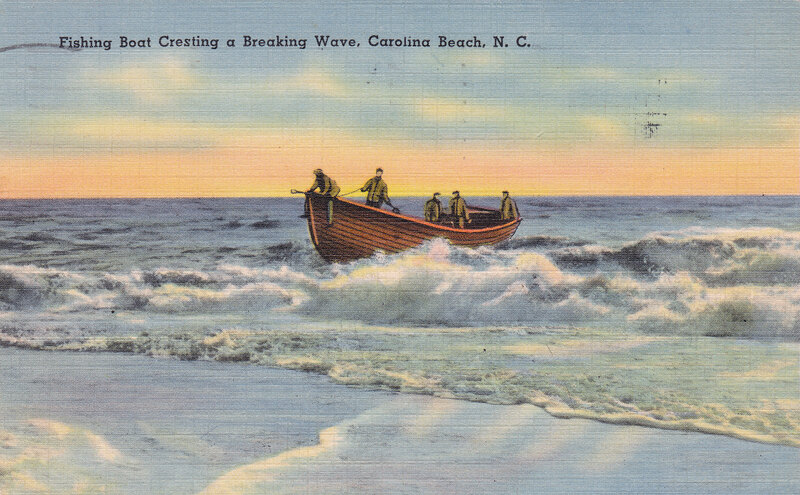 The fact that they were able to rebuild two entire blocks from ashes in just a few months earned Carolina Beach the nickname “The South’s Miracle Beach”. The new brick three story Bame Hotel boasted eighty rooms; sixty five of those rooms had their own bath. The hotel floors were tile on the first level and hardwood on the second and third floors. Red leather chairs graced the spacious lobby. The new Bame also had an elevator, a dining room and a grill that was open extra hours. This postcard shows the Hotel Bame, rebuilt in 1941, with the Bame Esso Service Station and Grocery next door. The station and grocery was run by J. C. “Mike” Bame. It started as just a station, later they added the grocery store and a second story with rooms to rent. Eventually another two story building was added to the back that housed apartments. 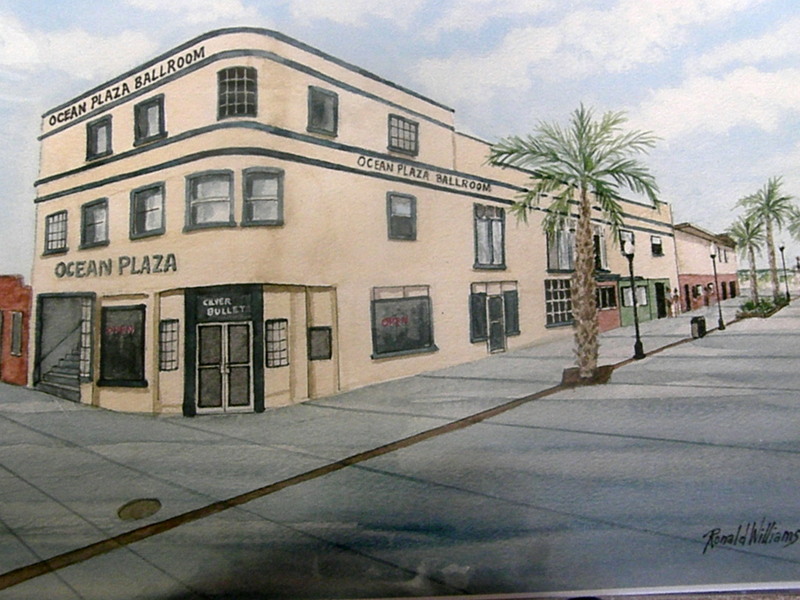 This building still stands on Cape Fear Blvd. and was most recently used as the Sterling Craft Mall. Some of the eleven Bame children were settling at the beach, raising families and beginning to make their mark. In 1942, Ruby, her husband Jim Knox moved to the beach year round. Ruby’s brother Ernest, who was also called “Tite”, had the Gulf service station across the street from the hotel. 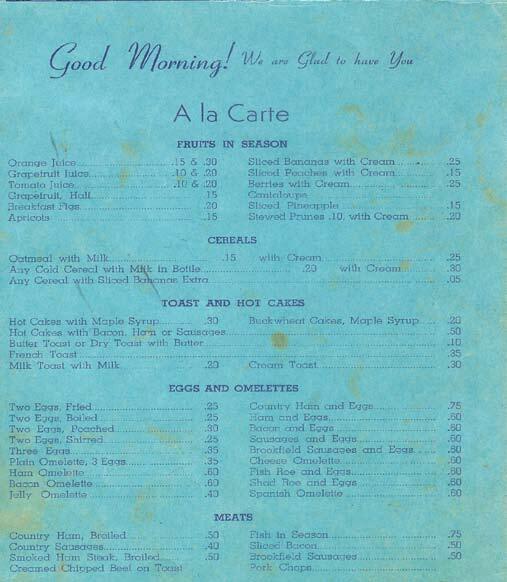 A menu from the dining room in 1941. World War II took Ernest away to serve in the Army Air Force and in his absence Jim Knox managed the station. When the war ended, Jim and Ernest became partners and also opened at hardware and appliance store next to the Gulf Station. J. C. “Mike” Bame, another brother, ran the Esso (at other times Pure and Texaco) station and grocery store also on Cape Fear between the Bame Hotel and the Greystone Hotel. Juanita Bame Herring and her husband Alan ran the grill at the Fisherman’s Steel Pier and later the restaurant at the Center Pier. Eldest brother, George, continued to come every summer to run the hotel. 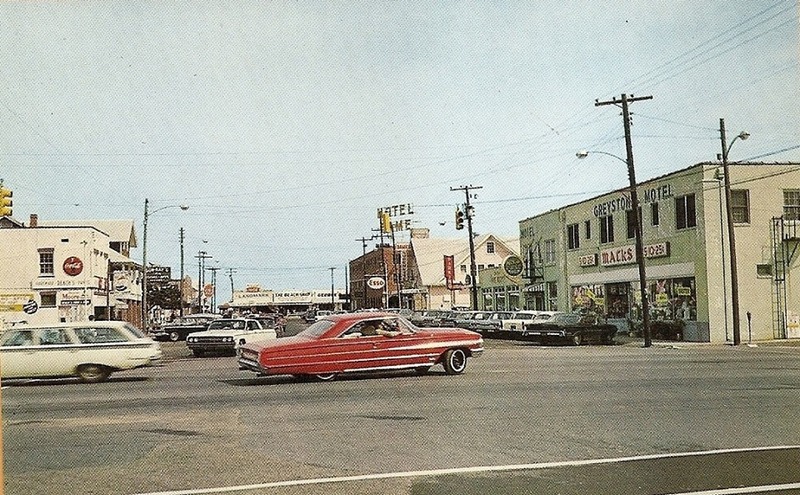 Ernest and Mike Bame both served as mayors of Carolina Beach in the 50s and 60s. Mike was also the fire chief, a volunteer position, and had a parking place reserved for the chief in front of his station and grocery store. Mike’s son, Larry Bame, helped out at the station and store growing up at the beach. He was a soda jerk at the hotel grill and later worked at the Fisherman’s Steel Pier built by his father and grandfather and John Fergus in 1953. The pier was 1000 feet long and located just off the boardwalk south of the Bame Hotel. Larry also remembers a pool room and barber shop in the hotel. Larry Bame will never forget the morning of October 15, 1954. He rose early and rode his bicycle over the Snow’s Cut Bridge to go squirrel hunting. Soon after, high winds and rain sent him back over the steel swing bridge where he could see the ocean over the dunes…a sight he had never seen before. Upon reaching the family home on Charlotte Avenue, his mother Alice sent him straight to the grocery store next to the hotel to help his father and grandfather get the merchandise off the floor since a hurricane was coming. Larry remembers seeing the ocean lapping over the steel pier when he arrived and the streets filled with water. They worked furiously to save as much as they could from the rising water which reached a height of almost two feet in the store. Larry, his father and grandfather were never able to go home until the hurricane was over. Across the street, Ernest Bame and Jim Knox weathered the storm in the Gulf station and appliance store. Ernest’s wife, Rachel Bame, remembers seeing refrigerators and other appliances floating in the store the next day. The Bame’s water damaged hotel and stores were still standing after Hazel, unlike most buildings all over the beach. 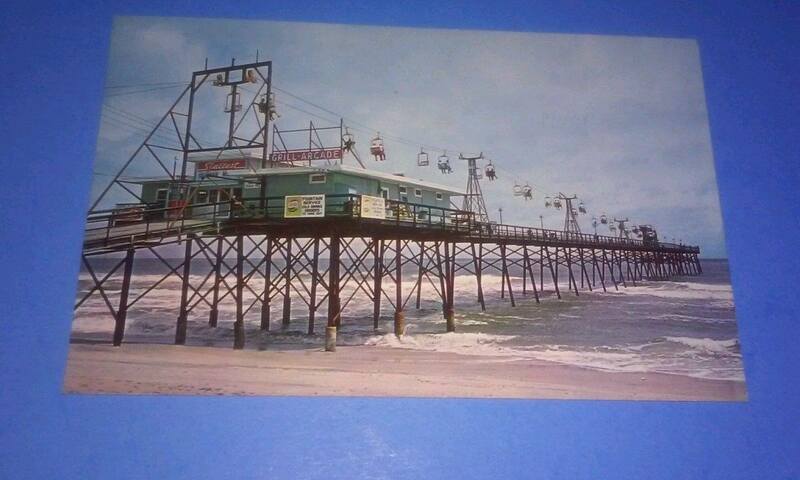 The Fisherman’s Steel Pier, built in 1953, was just off the boardwalk and south of the Bame Hotel. The pier enjoyed only one season before being severely damaged in Hurricane Hazel. It was rebuilt and later the popular Skyliner ride was added. 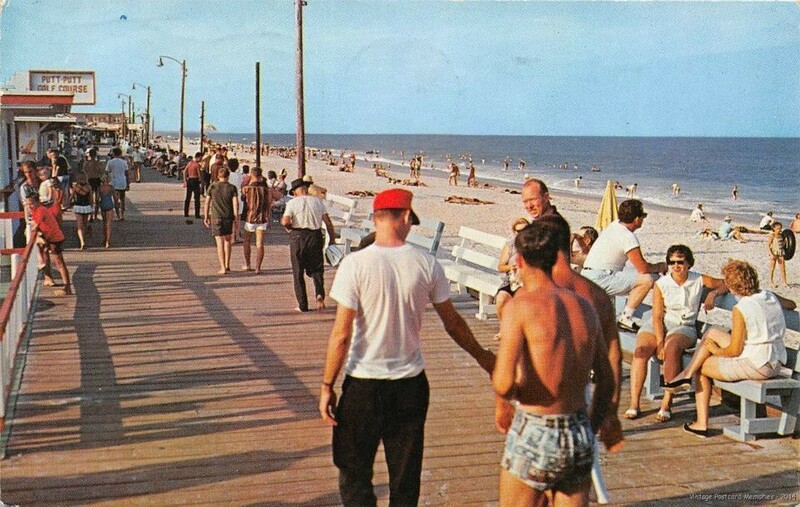 (picture – 1964) The pier remained until more hurricane damage forced its demolition in the 1970s. But, the steel pier suffered badly and was shortened by 200 feet. Hurricane Hazel, the only category 4 hurricane to hit our area in all of the twentieth century, had come in on a lunar high tide leaving a swath of damage you had to see to believe. After Hazel’s repairs, a cable car ride was installed at the Fisherman’s Steel Pier called the Skyliner. The Skyliner took riders high in the air over the pier and was a huge success for a few years. The pier was again the victim of hurricanes in the 70s and was finally torn down. “Mr. Jim” and a partner also built the Center Pier in Wilmington Beach. The pier’s restaurant was a popular place for lunch and dinner meetings for many civic organizations at the beach and was renowned for their seafood. [In 1996 Hurricanes Bertha and Fran destroyed most of Center Pier and what remains is now the popular Tiki Bar at the Ocean Grill]. J. R. Bame died in 1959. His son George continued to manage the hotel until his death in 1968. The family leased it for a couple of years after that and finally sold to investors from Myrtle Beach in the early 70s. They tore it down and built a water slide in its place. It marked the end of the Bame Hotel but the family continues to be a part of the Carolina Beach community into the 21st century. NEW HANOVER COUNTY, NC – New Hanover County Public Library announces a 5-part reading and discussion series called Let’s Talk About It: Making Sense of the Civil War, starting at 6:00 pm on September 9 at NHC Northeast Library, 1241 Military Cutoff Road. Dr. Chris Fonvielle, UNCW professor and Civil War Historian, will speak briefly and lead the discussion on the readings participants will read before each session. These programs are scheduled in observance of the 150th anniversary of the Civil War. The project is made possible by funding from the North Carolina Humanities Council, a statewide nonprofit and affiliate of the National Endowment for the Humanities. Additional support is provided by the Friends of NHC Library. The Federal Point Historic Preservation Society will hold its monthly meeting on Monday, September 15, 7:30 pm at the Federal Point History Center, 1121-A North Lake Park Blvd., adjacent to Carolina Beach Town Hall. This month’s speaker will be Norm Melton, a retired teacher. Norm grew up around his mother’s gift shop. Marie Melton operated her gift shop on the Boardwalk from 1946-1971. Norm was in elementary school when they arrived and graduated with the Carolina Beach Elementary School class of 1964. He went on to graduate from New Hanover High and UNCW as well as getting a Master’s Degree from East Carolina. Norm taught marketing over a long career that concluded with retirement from North Brunswick High. 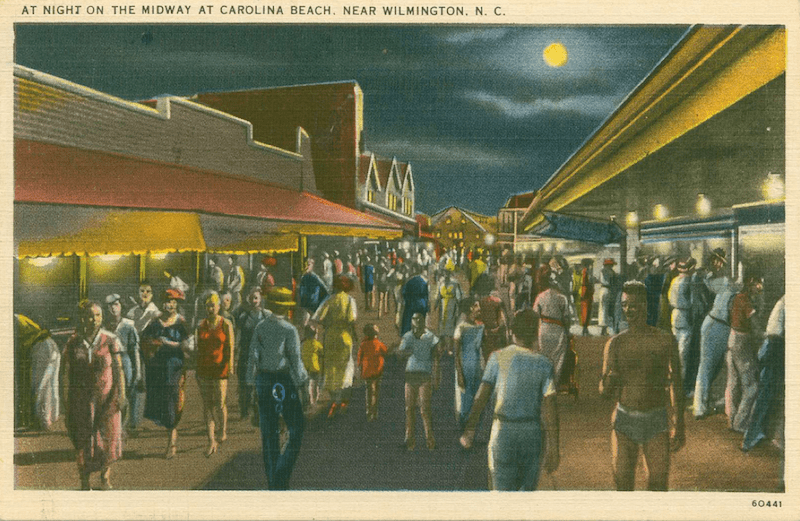 Norm Melton is speaking to us this month about growing up on the Carolina Beach boardwalk, so in that vein here’s another postcard showcasing the boardwalk, this one at night. 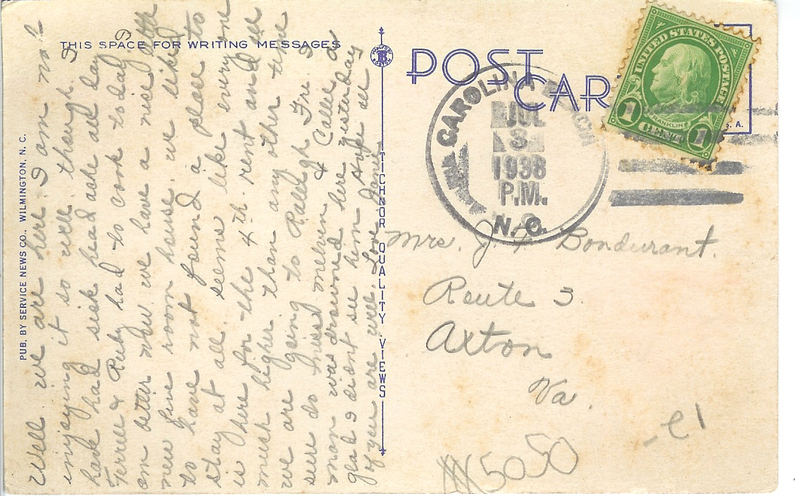 This postcard is postmarked from Carolina Beach on July 3, 1938 and is from a lady named Janie who mailed it to Axton, Virginia and who also had a very trying vacation. This month’s speaker will be Norm Melton., a retired teacher. Norm grew up in his mother’s gift shop. 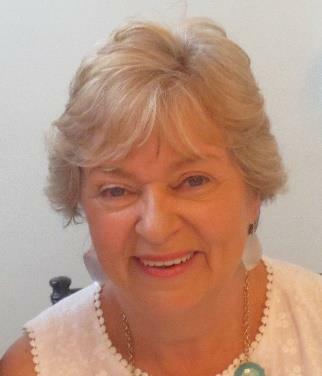 Marie Melton operated the gift shop on the Boardwalk from 1946-1971. Norm was in elementary school when they arrived and he graduated with the Carolina Beach Elementary School class of 1964. We’ve looked at next year’s budget and postage continues to take up a large chunk of change. If you have e-mail, please consider getting your Newsletter electronically. It’s much prettier, more timely, and in color that way. If you aren’t quite in the 21st century technologically we’ll still mail to you – But one of our members who wants to save paper copies has come up with a great idea. He gets his via e-mail and then picks up a paper copy when he comes to the meeting. (That way we save postage.) Remember: the most current Newsletter is always posted on our web site: Federal-Point-History.org The last 16 months of Newsletters can always be always found at: federal-point-history.org/category/current-newsletter/ Just click the ‘Newsletters’ tab in the right hand column. The History Center recorded 62 visitors in August. We had 35 in attendance at the August meeting. The gift shop took in a healthy $269.22; NOT counting all the cookbooks sold. The History Center was also used by Got-‘em-on Live Bait Fishing Club. PLEASE NOTE: We have a couple of long sleeve T-shirts and some FPHPS sweatshirts on sale. T-Shirts – $5.00. Sweatshirts – $12.00. Great for yard work or other grungy projects. Please welcome new lifetime member Lloyd Saunders of McKinney Texas, and new Business members Island Tackle and Hardware of Carolina Beach and Big Daddy’s of Kure Beach. Thanks to Demetria Sapienza, and Lois Taylor for helping get the Newsletter in the mail this month. Also thanks to Sylvia, Juanita, Ron, and Lois for keeping the History Center open while Rebecca was away. Thanks AGAIN to Andre’ Blouin for all the time he’s put into the new website. Tony Phillips is keeping things growing on our Facebook page. By posting snippets from articles posted on our website, Tony’s directing thousands of Facebook viewers back to our Federal Point History Center website. If you are on Facebook please take time to “like” us and share our posts. 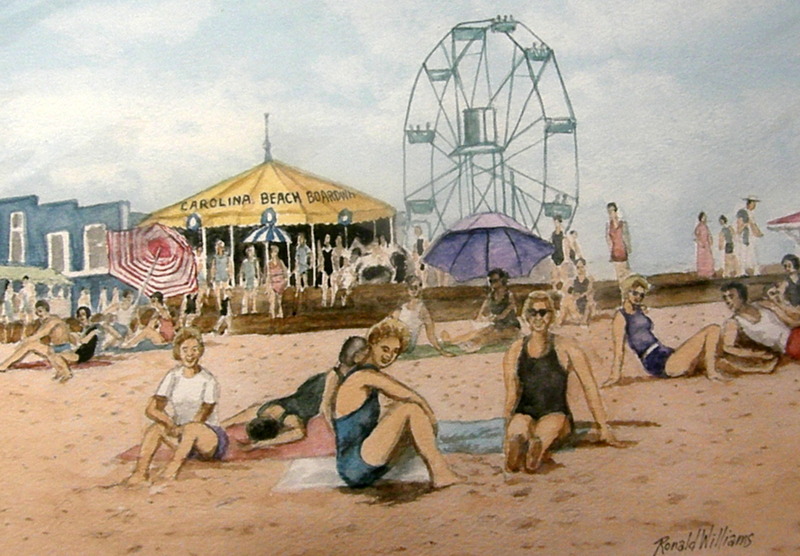 We have had two wonderful prints of Carolina Beach scenes donated by Ronald Williams via Norm Melton. We’ll hold the drawing at the Christmas Party, December 15th. You don’t have to be present to win. Have you bought your cookbooks yet?